6:52 p.m. - UPDATE: The National Weather Service has issued a Severe Thunderstorm Warning for the entire state of New Jersey until 10 p.m. .A line of strong storms is expected to intensify and spread eastward across the region with damaging wind gusts and occasional hail occurring into the evening hours. 6:36 p.m. - Severe Thunderstorm WARNING for Ocean, Burlington, southern Monmouth, SE Camden, northern Atlantic until 7:15 p.m. for a line of storms with wind gusts of 70 MPH that can cause considerable tree damage and damage to mobile homes, roofs and outbuildings. As a storm system digs through New Jersey late Sunday, some powerful and potentially dangerous thunderstorms are expected to develop. Models and radar trends suggest a few showers and light thunderstorms will be possible throughout New Jersey Sunday morning to early afternoon. The real show, however, will hold off until around 3 p.m. Storms will quickly form along the western border of New Jersey. The stormiest, most dangerous weather will likely occur between about 5 p.m. and 8 p.m. By 10 p.m. Sunday evening, storms should be pulsing down and/or moving off-shore. As the latest severe weather outlook from the Storm Prediction Center illustrates, everyone in New Jersey may see severe weather today. 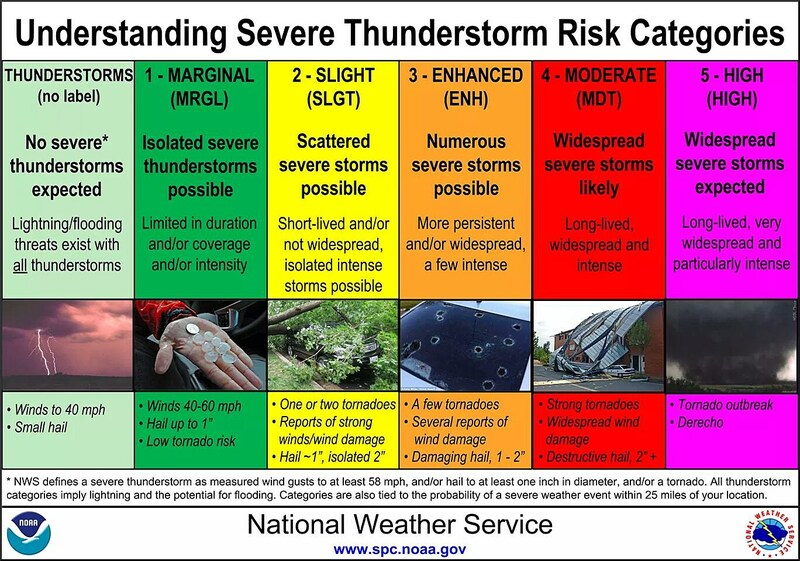 Most of the state falls in the orange "Enhanced Risk" area - this is the third highest of five risk categories, and indicates about a 30% chance of severe weather near any given point. The area north of Interstate 78 is in a lower "Slight Risk" for severe weather on Sunday, which carries about a 15% chance of hazardous weather. Most models show the severe weather bullseye to occur in the western and center parts of New Jersey, in Central and South Jersey (again, below Interstate 78). So, if you're out and about in places like Flemington, New Brunswick, Princeton, Trenton, Jackson, Mt. Holly, Cherry Hill, Glassboro, Vineland, or nearby communities? Please stay extra vigilant today. By far, storm-driven winds will be the biggest severe weather threat of the day. As heavy rain falls, it cools the surrounding air and the storm "pushes" this air out ahead of it. This "outflow" can arrive suddenly, be surprisingly strong, and cause a wide swath of damage. Wind gusts over 70 mph will be possible from Sunday's storms. That's one of many reasons why it's important to seek shelter in a sturdy building while these storms are passing overhead. Yes, it's going to rain. Yes, it might hail. Yes, there's almost certainly going to be lightning and thunder. And, of course, all are potentially dangerous. Overall rainfall totals are going to be meager by the end of Sunday, averaging about a half-inch. But if you get caught in a thunderstorm deluge, that total could climb much higher in a very short period of time. Flooding of low-lying areas with poor drainage is possible. Never attempt to drive, walk, or swim through flooded areas - water is an incredibly powerful force, and you (and/or your car) can get swept away in only a few inches of water. There is a good chance that the thunderstorms that form Sunday afternoon will be discrete cells. If these storm cells begin to rotate, it is called a "supercell" thunderstorm - the breeding ground for a tornado. Tornadoes are rare in New Jersey, but they do happen occasionally (on average the state sees about 3 a year). The overall risk for tornadoes on Sunday is low - just 2%, according to the Storm Prediction Center. Still, it's worth a mention because the chance is certainly there given the forecasted severe weather indices and parameters. Most probable location and timing for any tornadoes that form? See sections 2 and 3 above. As you know, my goal is to inform you of impending weather situations, so you can make good decisions to stay safe and dry when bad weather strikes New Jersey. I strive to be the meteorological voice of reason above the hype and hysteria, sticking to facts and truth. That is especially difficult and important because meteorology is such an imperfect, imprecise science. Having said that... If the ingredients indeed come together as I've described, these are going to be some of the strongest thunderstorms New Jersey has seen in a while. Trees may come down, power may go out, shingles and lawn furniture may fly away, and windows may be broken. I certainly wouldn't want to be on the beach, at the park, or on the road when the worst weather pops up. Sunday will be one of the few days of the year where New Jerseyans from top to bottom need to remain actively weather aware. That means if you're outside and the sky starts to get really dark, or if you can hear thunder roaring, or if a warning is issued for your area, it's time to head inside. Unfortunately, I'm fighting a nasty stomach bug. And it's my son's first birthday too! (Our trip to the zoo has been postponed due to the storm threat.) I'm going to try to be as active as possible online and on-air with communicating the latest warnings and weather info as these powerful storms push through New Jersey. Dan Zarrow is the Chief Meteorologist for Townsquare Media New Jersey. Follow him on Facebook or Twitter for the latest forecast and realtime weather updates.